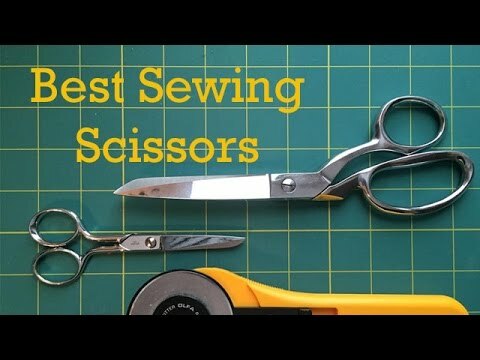 Every sewer should have at least two pairs of sewing scissors, one for cutting fabric and the other for trimming excess fabric and loose threads. There are however all sorts of cutting tools available, you’ve got your scissors, snips & shears. Knowing which tool to use for which job can be the difference between the home-made or professional look. Discover now the variety of cutting tools available, and how each one can help you get the perfect finish to your sewing projects. Snips are a small sharp spring-loaded tool, perfect for snipping away those loose threads, these are not suitable for cutting or trimming fabrics. Rotary cutters house a very sharp rotating bladed disc, available in a variety size. 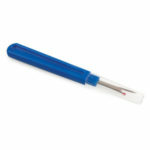 They are ideal for cutting straight or gentle curved edges. Anything that has sharp angles or is intricate in any way best use scissors. 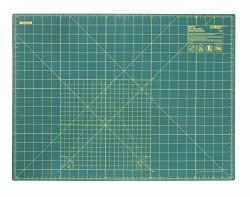 You should a rotary cutter with a special cutting mat in order to protect the blade and you work surface. Buttonhole chisel is very similar to a wood working chisel, being extremely sharp it cuts cleanly and accurately through the fabric to create a button hole, really useful on heavier fabrics. If your using one of these do so with a with a cutting mat, to prevent any damage to your work-surface. The seam ripper. This odd looking tool has a sharp pointed hook which allows it to slide underneath stitchs, and with a cutting blade at its base can cut through the threads. Used for unpicking stitches and seams, it can also be used to create button holes in thin lightweight fabrics. A self healing mat used to protect work surfaces, perfect if your using rotary cutters or button hole chisels. 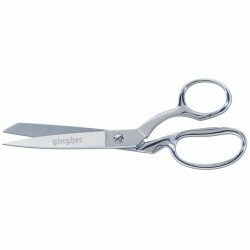 These type of scissors have a blade that can sit flat against the table when cutting out due to the angle of the handle in relation to the blades. Ideal for cutting long straight edges. 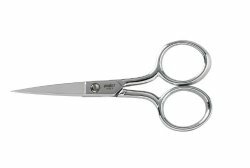 Cutting shears are the most common type of sewing scissors, used for everyday cutting of fabric. The length of the blades can be anywhere between 8-12in in length. 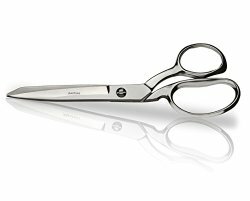 Similar in size to cutting shears with one noticeable difference, the blade cuts with a zig-zag pattern. Perfect for limiting fraying edges on prone fabrics such as silk. In addition they can also add a nice decorative edging. 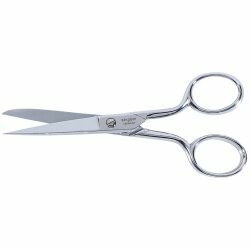 A smaller version of cutting shears, trimming scissors have a blade of about 4in in length and are used to trim away excess fabric and neaten ends from machining. These type of scissors are small and very sharp. Ideal for getting into those tight corners, cutting intricate details as well as cutting threads close to the fabric. When it comes to using patterns, paper scissors are a must. Used to cut around pattern pieces these will save your other sewing scissors from becoming blunt. As cutting paper will quickly dull the blades of fabric scissors and shears. Whether you’re a beginner or you’ve been sewing for years, there’s no doubt that some of these cutting tools will be of use to you. And will find a new home in your sewing box. Though the main thing to remember is, always buy good quality sewing scissors that can be re-sharpened, look after your tools and they’ll look after you.